Our Macmillan coffee morning is fast approaching!! Come and join us on 29th September. We are offering coffee, tea and cake from 9.30 til 4.30pm. Last year Macmillan raised a whopping total £29.5million!!!!! The first ever Coffee Morning happened way back in 1990. It was a rather small affair with a simple idea: guests would gather over coffee and donate the cost of their cuppa to Macmillan in the process. It was so effective, they did it again the next year – only this time nationally. 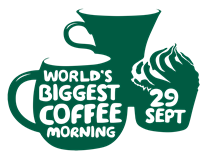 Since then, Coffee Morning has raised over £165.5 million for Macmillan. Please come and donate to this very worthy cause! !